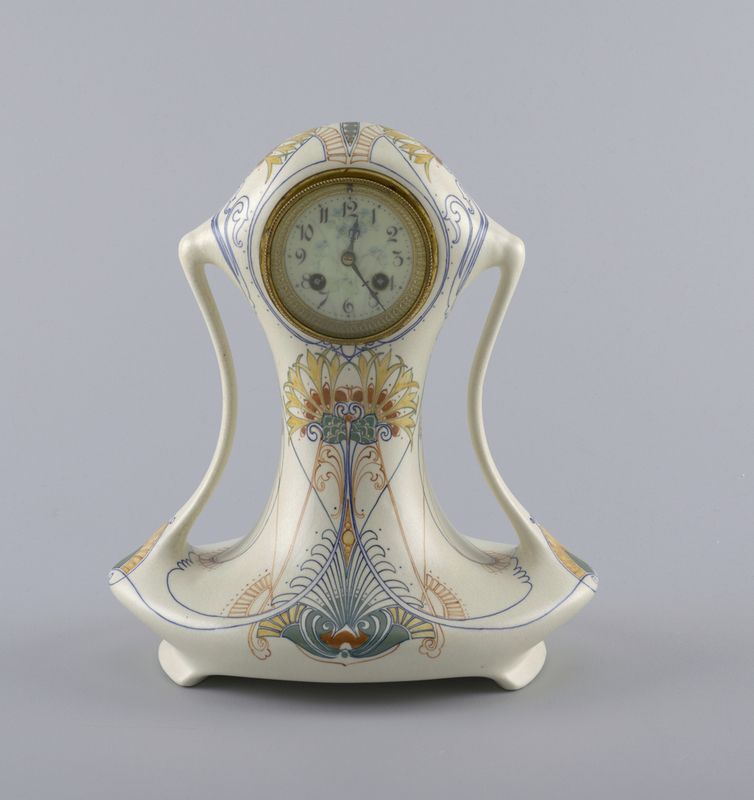 This Dutch glazed earthenware clock, manufactured in 1910 by the Arnhem Faience Factory exemplifies the Art Nouveau style, or Nieuwe Kunst as it was called in the Netherlands, prevalent in that country from about 1892 to 1910. Art Nouveau had origins in England and quickly gained popularity in France and the rest of Europe as well as the United States. The style emphasized an inspiration from natural subjects like the flowing shapes and generous curves of plant and flower forms. The Nieuwe Kunst interpretation of this movement sought to unify both form and decoration in a way that was uniquely Dutch, especially in comparison to French Art Nouveau which focused primarily on the decorative. This particular clock was made by the brothers Jacob and Klaas Vet, who founded their pottery factory in Arnhem in 1907, after a previous effort in Purmerend was cut short by a devastating fire in 1906. The next year in Arnhem, the brothers continued to focus on floral patterns of thin and sinuous lines painted in subtle colors like blue and mustard yellow. These details accented the light cream-colored ground of the pottery, which was a matt under-glaze that imitated Bert Nienhuis’ work at De Distel Pottery, one of the Netherlands’ most prominent ceramic manufacturers. The delicate linear decoration and stylized plant motifs decorating this earthenware piece, as well as its similarly expressive curving handles, suggest the constant flowing of time that the object itself measures, while the precise symmetry of the patterning also highlights the orderly nature of timekeeping. The clock’s design exemplifies the union of function and style, in true Nieuwe Kunst fashion. Eliëns, Titus M., Marjan Groot, and Frans Leidelmeijer, Dutch Decorative Arts: 1880-1940. (Bussum: Battledore Ltd, 1997), p. 20.